Six RD-276 first stage main engines ignited with a rush of orange exhaust at 0710 GMT (3:10 a.m. EDT) Thursday, propelling the 191-foot-tall (58-meter) Proton launcher into an overcast afternoon sky at the Baikonur Cosmodrome in Kazakhstan. The Proton rocket dodged a glitch during its climb into orbit, when one of four second stage engines switched off nine seconds early, according to Russia’s Interfax news agency. The first of five engine firings by the Proton’s Breeze M upper stage ran more than 30 seconds longer than expected, apparently to overcome a velocity shortfall caused by the second stage problem. The rest of the mission appeared to go as planned. It took more than 15 hours for the Breeze M upper stage to inject the spacecraft into a “supersynchronous” transfer orbit, with five burns of the long-lived space tug planned to place the satellite on a trajectory with a high point up to 40,400 miles (65,000 kilometers) above Earth. 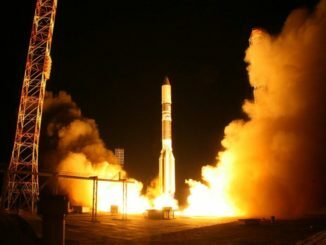 Officials with International Launch Services, the Virginia-based company responsible for commercial Proton rocket sales, declared the flight a success after telemetry radioed from the Breeze M upper stage confirmed the deployment of the Intelsat 31/DLA-2 satellite around 2241 GMT (6:41 p.m. EDT), shortly after the main engine’s fifth firing. Tracking data indicated the spacecraft was delivered to an orbit very close to pre-flight targets, within 1.1 meters per second (2.4 mph) of predictions. The successful launch Thursday capped the deployment of two near-identical satellites in a partnership between Intelsat and DirecTV Latin America valued at more than $500 million. Khrunichev State Research and Production Space Center is the Russian builder of the Proton/Breeze M launcher, and owner of ILS. Thursday’s launch marked the first flight an upgraded version of the Proton rocket, called “Phase IV” enhancements, to haul heavier payloads into orbit. The modifications are the latest in a series of phased upgrades introduced on the Proton rocket since 2005, replacing the “Phase III” version that first launched in 2009. With the new design changes, the Proton/Breeze M can hoist up to 13,889 pounds, or 6.3 metric tons, into a standard geostationary transfer orbit, the egg-shaped path taken by most large communications satellites on the way to operational posts more than 22,000 miles (35,700 kilometers) over the equator. The 7-ton Intelsat 31/DLA-2 satellite deployed Thursday went into an even higher orbit, minimizing the work required of the craft’s on-board propulsion to reach a final perch in geostationary orbit parked at the equator at 95 degrees west longitude. The satellite will enter service within a couple of months, and the extra lifting accomplished by the Proton/Breeze M launcher Thursday should extend the mission’s lifetime from 15 years to at least 20 years, according to Guillemin. 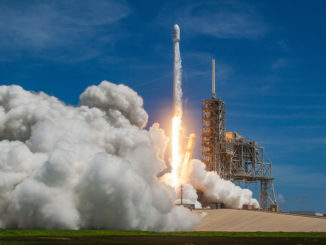 Intelsat said ground controllers acquired the first signals from the newly-launched spacecraft late Thursday, verifying its health after the trip into orbit. DirecTV Latin America has leased all of the satellite’s Ku-band communications capacity to broadcast hundreds of high-definition television channels to customers across Central and South America and the Caribbean. Intelsat retains the use of a smaller C-band payload on the spacecraft. Manufactured by Space Systems/Loral of Palo Alto, California, the Intelsat 31/DLA-2 satellite is the second of four Intelsat spacecraft due for launch this year. 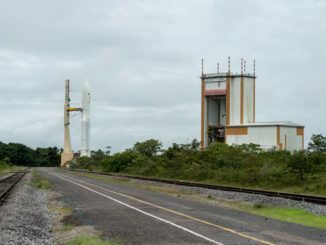 The first of the company’s new-generation “Epic” satellites blasted off on an Ariane 5 rocket in January, and two other Intelsat payloads are booked for an Ariane 5 launch later this year. The newest member of Intelsat’s fleet joins a nearly identical satellite named Intelsat 30/DLA-1 launched on an Ariane 5 mission in 2014. 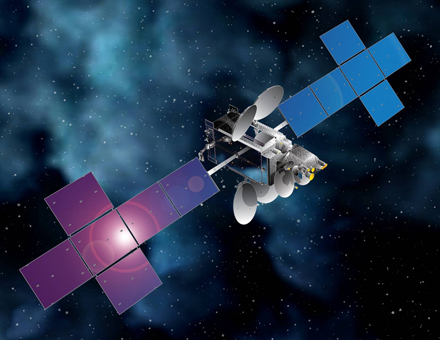 The next Proton launch is scheduled by the end of the summer with the EchoStar 21 satellite, a commercial platform to serve the mobile communications market in Europe.